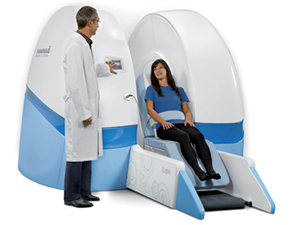 MrOpen is a True "Open" MRI providing a relaxing environment for patients. 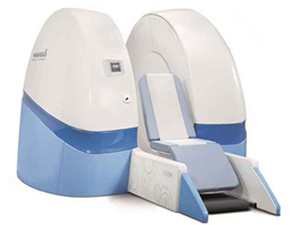 MROpen is a “totally Open” MRI system that provides unparalleled patient comfort, thanks to its innovative and revolutionary Upright magnet design. The vertical opening accommodates larger, claustrophobic, elderly or young patients, or those who are in pain, by providing an Open Sky scanner with no barrier between the patient and the environment. You can walk into the scanner and, depending on which part is being scanned, you can sit,lie slightly backward, lie horizontally or even stand. With no barrier between the patient and the surrounding environment, patients can see around them at all times or enjoy watching TV while comfortably seated in the scanner undergoing an MRI procedure. All this simply can’t happen in conventional closed MRIs or even in “traditionally open” (C-shaped) systems. Claustrophobic reactions have so far never occurred in any one MROpen clinical site. Patient anxiety appears like a memory of the past. 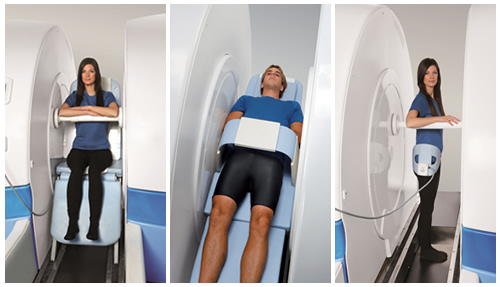 MROpen is the only superconductive MRI system that provides Upright Imaging of the Spine and Joints, allowing to scan patients using a full Weight Bearing approach. Imaging the Spine in the Sitting or Standing position, now you can SEE the extent of the pathology, by looking at it on Weight Bearing MR scans. Upright MRI is changing the clinical approach towards pathologies of the Spine and Joints, by allowing earlier detection and more accurate diagnosis, thus improving overall patient outcomes. MROpen’s 0.5 T main magnetic field is oriented in the transverse direction. This amplifies the advantage of phased array coils, bringing image quality to higher levels. MROpen provides anatomy-specific dedicated coils with MAX technology. These multi-channel coils combine flat with solenoid type coils, providing superior performance in every anatomical area. MROpen’s green technologyprovides cryogen-free operation thanks to its innovative superconductive material. With no need for cryogens, helium refill becomes a memory of the past. MROpen is more friendly to the environment than any other superconductive MRI available. With helium-free green technology, electrical power consumption is reduced to a fraction of what needed with conventional MRI systems.